If you are currently experiencing acne and trying to find a natural, long lasting solution, this is a recipe for you. Very easy to make and very effective! Use the power of nature to erase day after day your clogged pores, treat your spots, cleanse your skin. Mix the above liquid ingredients in a bowl. Cut dime size sheets of rice paper to fit over your spots or recent acne scars (or larger pieces if you would like to apply the mask over your whole face but be careful not to apply close to your eyes). Dip the pieces of rice paper in the mixture for a few seconds. Apply where needed and leave on for 15 to 20 minutes before gently rinsing! Always a good idea after rinsing your face with tap water to spray on some filtered or even better Thermal Water on your face. Voila! If you have a spot that you are trying to get rid off at the moment (we feel for you, all been there! ), you can use this everyday until your spot is gone. If it’s for all over acne or just prevention, you can use twice a week all over the face. Rose Floral Water stimulates the skin, increasing the blood flow and balancing the pH of your skin. It also helps balance sebum production. Origan Essential Oil has great purifying properties, but be careful to never use this oil pure! It is extremelly strong and could damage your skin! Grapefruit Seed Extract is a strong antiseptic and is full of antioxidants. A piece of Rice Paper soaked in your mixture will progressively diffuse the active ingredients to your skin (kind of like a sheet mask but more effective and eco-friendly!). 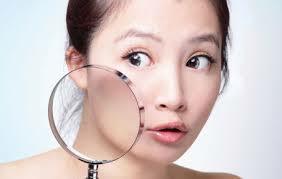 Rice paper also has soothing anti inflammatory properties that will assist in bringing down the redness of acne. Arrow Root Extract Powder will thicken your preparation allowing it to stay and slowly diffuse the active ingredients in your patch. And it will also help heal our sores and wounds. Hope you have enjoyed our recipe and please let us know if you have tried it in the comment section below!